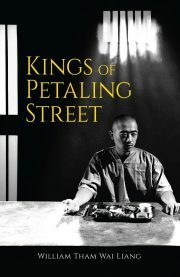 William Tham Wai Liang’s Kings of Petaling Street is a standalone crime thriller. Wong Kah Lok Syndicate’s power is waning, but it is still one of the most powerful gangs in Kuala Lumpur. Gangster Wong has slowed of late. The heart went out of the aging criminal when his wife and oldest son died in an assassination attempt. Wong’s primary goal is now to see his remaining son, Gavin, settled in a respectable, safe occupation. He shows poor judgment, then, in allowing the heir apparent to his gang, Crazy Foo, to mentor the impressionable Gavin.